Taste test: These are AWESOME chips! Like salt & vinegar, I wasn't a big fan of salt & pepper chips when I first tasted them. These chips, because of their rippled nature, actually hold the salt & pepper flavor better. These are better than the Terra salt & pepper and the Utz versions. I would buy these whenever I found them. Smell test: Pretty big peppery smell. 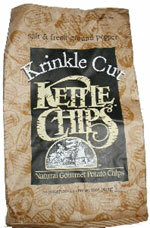 This snack was discovered by Keith at Whole Foods Market (formerly Bread & Circus).